This entry was posted on Wednesday, July 8th, 2015 by Frances Ryan. Once again, my work day saw me walking to-and-from my office for all-important errands. And, once again, I seem to have stumbled into a charity shop (or two) along the way. First, a quick explanation of the out-of-office wanderings, which will also serve as a mini-PhD update: I finally entered the empirical research stage of my PhD studies last Friday. (Yay!) Then on Monday I had to hand-deliver pilot materials to one of my participants. And today, I had to post materials to another participant. Anyhow, today’s finds happened first on the way to the post office when I ducked into a shop to avoid a quick rain shower. There, I found a lovely green and silver beaded necklace. It’s one of those really long ones, but I will wear it doubled-up so that it sits nicely on my chest. A true bargain for £1. My next find was on the way back from the post office. I can’t really blame the rain this time, as it was only a light sprinkling, but I felt compelled to enter the shop anyhow. 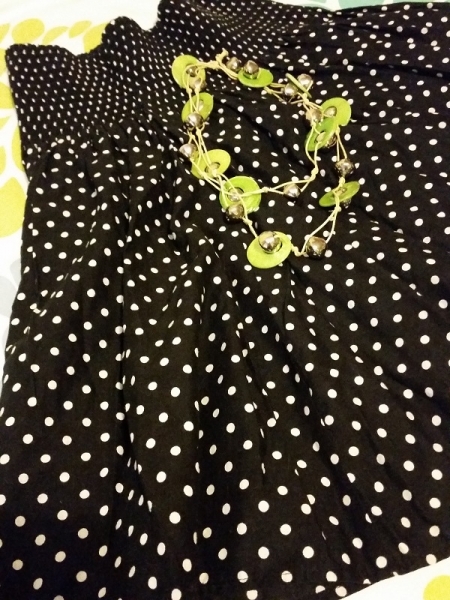 And that’s where I found a cute little black and white polka dot skirt from H&M. It was on sale for £1 so I decided I had to have it. The material is fairly thin though, so it’s definitely a skirt that will require a slip. However, I think I might experiment with this one by attempting to sew a slip into the waist band. After all, I do want to improve my (very limited; very weak) sewing skills. It might be a little frivolous to be spending money so willy-nilly, but it was only £2. Still, I suppose it’s a good thing that my weakness is cheap clothes from charity shops and not in-season new stuff from Jenners! My meagre student budget just wouldn’t survive!